MAIN POINT: Leaders Need Courage, Initiative, and Integrity. "Be strong and courageous. Do not be afraid or discouraged because of the king of Assyria and the vast army with him, for there is a greater power with us than with him. Hezekiah is one bright light in a situation of dark gloom and potential doom. With courage, he encourages the people to stand up against the enemy. Simply because, God is with them. He knows it. He wants Judah to know it. He makes sure that the enemy knows it. As a result, Sennacherib becomes the frustrated Assyrian king who never really did conquer Judah. Despite his taunts to the Jews, and him stirring up his own forces for attack, plus a large efforts in war propaganda, Sennacherib suffers a humiliating defeat. He ends up slain by his own children (2 Chronicles 32:21). As Hezekiah leads boldly as leader of the nation, the LORD protects Judah and fights against the enemies. Kudos to King Hezekiah! Such courage is commendable. Leaders are expected to manifest this trait. Unfortunately, there are some leaders in this world that does the exact opposite. Instead of fighting fear, they flee. Instead of standing up to be responsible, they shrink back from taking charge. 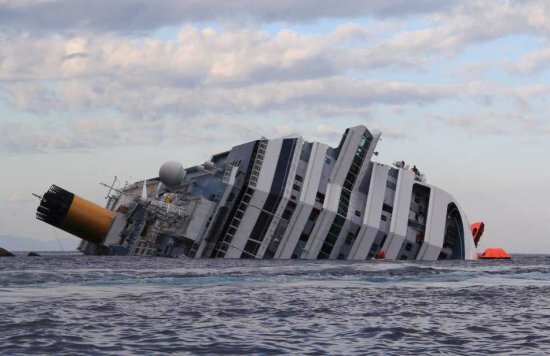 One example is Captain Francesco Schettino of the ship, Costa Concordia, one of the largest luxury cruise liners in the world. On the evening of January 14th, 2012, the Costa Concordia ran aground when it hit rocks along the island of Giglio, in Italy. Carrying 4234 passengers including crews, with more than half a million gallons of fuel, there is danger to both humans as well as an ecological disaster. As the ship keels over to its side, passengers jump off the ship for their lives. The captain of the ship flees on a life boat, paralyzed as to what to do. For more than 70 minutes, while crews wait for the command to abandon ship, the captain is non-existent. Schettino has fled on a life boat, leaving both crews and passengers to fend for themselves. This failure to act has become a police matter. Schettino has been charged for manslaughter, for running the ship aground, and for failure to be the captain he has been expected to be. He fails as a leader because he has not demonstrated a critical initiative to act. Preferring to save his own skin, the lives of the crews and passengers appear to be the last thing on the captain's mind. A voice recording has been released to the public, showing how the captain shrinks from his responsibility as a captain. The Coast Guard in charge of the rescue operation has to literally order Captain Schettino to get back on the ship to direct rescue efforts. After all, the ship is the captain's responsibility. Instead, it takes an off-duty personnel on the ship to give out the order for the occupants to abandon ship. Roberto Bosio, himself an off-duty captain, condemns Schettino's actions as 'disgraceful.' He fails as a leader for failing to be courageous when called. When asked why he has abandoned the ship in the first place, Schettino's confession turns out to be a bigger joke. He gives the excuse that he 'fell off from the sinking ship into a lifeboat.' Fear causes him to flee first for his own safety. Fear also makes him fend off blame by giving the most incredible excuses. Such a captain is no leader. He has no courage to take action. He has no initiative to direct the rescue efforts. He has no integrity to own up for what he has done, or not done. The disaster itself is already bad. Schettino's actions have made it worse. He fails as a leader for the lack of integrity. It is the quality of the inside that leads to the quality shown outside. Far too often, people seek after accolades and prestige on the outside. They want the title. They desire the fame. When the bough breaks, and the cradle falls, and when everything comes crashing down, the one possessing the title is put to the test. Courage is essential. Initiative is expected. Integrity is exacted. All of these are missing from the actions of Captain Francesco Schettino. I wish this has never happened. It gives me no pleasure in seeing leaders trip over themselves. Hezekiah has been able to demonstrate true courage because of his trust in God. He keeps to his obedience of God. God sticks to His promise to deliver. Hezekiah believes. God honours that faith. Hezekiah urges the people of Judah not to fear, beginning with himself. God is pleased with the trust, and strikes fear in the hearts of Judah's enemies. Do not covet the title of 'leader' without understanding the three important traits that come with it: Initiative, Courage, and Integrity. If one is not prepared to be a leader, do not chase after the title. It may cause grievous harm to others. Copyright by SabbathWalk. This devotional is sent to you free of charge. If you feel blessed or ministered to by SabbathWalk weekly devotionals, feel free to forward to friends, or to invite them to subscribe online at http://blog.sabbathwalk.org . You can also send me an email at cyap@sabbathwalk.org for comments or enquiries.